The Games and Rides Area at Sports Connection features the most popular games, simulators, ticket redemption games and best prizes, all under one roof! 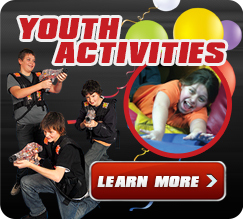 Whether you want to Book A Birthday Party or are just looking to come have some fun, Sports Connection's Games and Rides section has over 100 games and rides for the whole family. Special Game Rates available when purchased at the same time as other Attractions. Use your CONNECTION Credit Card on any game or ride and begin collecting tickets and points to redeem for your favorite toys and prizes from our Redemption counter.